A native of Albuquerque, New Mexico, Scott received his bachelor of music degree from Arizona State University, where he was a student of Sam Pilafian, and attended the San Francisco Conservatory of Music as a student of Floyd Cooley. He is a full-time professional musician, keeping a schedule which includes private studio teaching and performing with orchestras throughout California. He frequently performs with the San Francisco Symphony, Santa Rosa Symphony, San Francisco Ballet, and also records with Skywalker Studios. Currently, Scott is principal tuba with the Fresno Philharmonic, Oakland East Bay Symphony, Napa Valley Symphony, Vallejo Symphony and Stockton Symphony. 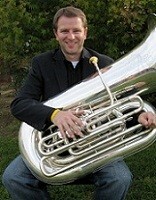 He has also taught tuba performance at Fresno Pacific University, UC Davis and San Jose State University.